Spencer Flack was a charismatic, debonair Anglophile American living in Hertfordshire who had made a great deal of money from aviation. He had a passion for aeroplanes and owned a Spitfire, a Hunter and a Sea Fury, all of which were painted in his signature fire engine red. A death defying accident in the early 1980’s in one of the planes pointed him in the direction of classic cars which included a Cooper Bristol and a 1959 Formula 1 car both of which were painted in his favourite livery, the latter being the car in which he sadly died in Australia in 2002. In the early 1990’s chassis No TN1569 was acquired, this being from a 3 Litre saloon car originally owned by Harry Ward Esq of Southport who bought it in 1928 and sold it to WA Crampin Esq of Grimsby who had an accident with a road roller. 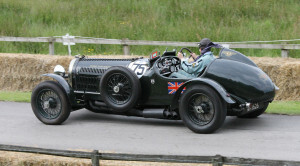 This necessitated the straightening of the front half of the chassis and the fitting of a reconditioned front axle. Mr Crampin proved to be a parsimonious sort and refused to pay the guarantee transfer fee so the factory cancelled it (not a good move because the factory guarantee in those days was 5 years!). It appears to have changed hands in both 1932 and 1937 and not much was heard of it until TM Ashford bough the car in 1948 and sold it in 1955 to R Norton Esq who registered it in 1957 and sold it to J Gosh Esq in 1979 who sold it in 1981. It is probable that the chassis was acquired by Neil Davis Racing on behalf of Spencer Flack who wanted a vintage racing Bentley that was as good as the best with no expense spared. John Guppy of McKenzie Guppy was certainly very much involved in the transformation/creation of this racer which emerged in the signature colour of (you guessed it!) fire engine red. 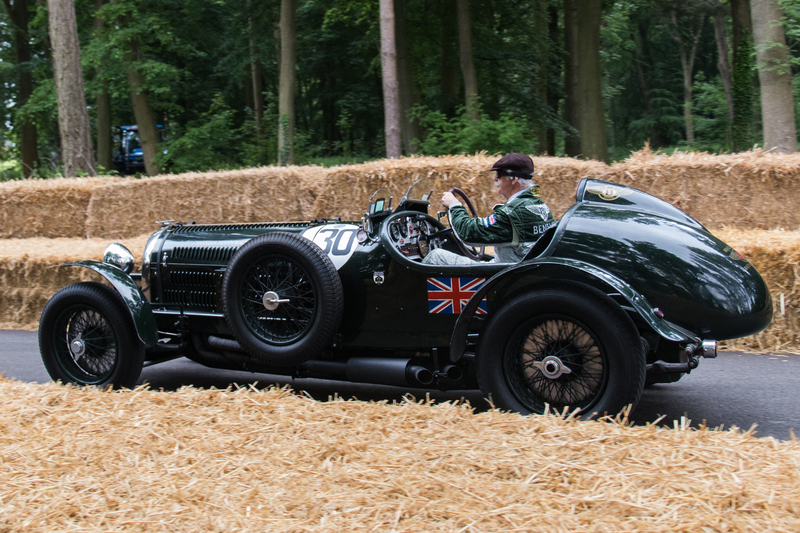 Built to the very highest standard an 8 litre dry sump engine was fitted producing 420bhp giving a 0 – 60 time of under 5 seconds and a top speed of 155mph. 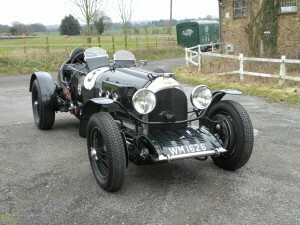 The car was much used in classic races and was timed at Millbrook in May 1996 at 139mph driven by Spencer Flack Subsequently passing to Clive Woolley Esq of South Africa in about 1999 it went into the ownership of Stanley Mann in 2001 who raced it in Bentley Driver’s Club events and at the Nurburgring Oldtimer Grand prix in both 2002 and 2005. It was sold to Joel Laub Esq in America where it raced in numerous events including Monterey in August 2007. WM 1626 came into the Twirp collection in April 2010 via Stanley Mann and Gregor Fiskern. Used on the road for fun (so much fun! )and at Harewood and Cholmondeley, WM 1626 is surprisingly easy to drive with a huge reserve of power and torque and a suitably disgraceful anti- social amount of noise! Neil Davies told me that peak power is at 4,500rpm although the engine is good for 5,000rpm. Apparently Spencer Flack had a number of diffs for different circuits so that he would be pulling 4,500rpm at the end of the straight !